CHICAGO — As I’ve lately been on something of a hiatus from writing previews or reviews of dance, in order to finish writing a book that includes it as a subject, this brief reflection on the spring edition of wood bone mill (spring sunset, sunrise sunset, sunrise) will have to be quick and dirty. A reflection on age and joy reminiscent of the dynamism in Kerry Skarbakka’s leaps from tall structures, this seasonal performance parallels the physics of the cosmos with that of the movement of a human life through its stages. Performed at the home of Bryan Saner, alongside the energetic Matty Davis, the dance is performed at times that align with the transit of the sun in its creation of the seasons. Given its significance and rigor as a performance, it’s a shame it hasn’t yet received sufficient critical attention, because it should. My attendance was at the April 20, 6:30pm performance, but performances have been scattered throughout the weekend (with the last one taking place April 21 at 6:30am, a tad past the scheduled 6:01am sunrise). Situated in the side lot of the Hermitage Ave. home Saner shares with his wife and a cohort of friends, a Mulberry tree rises imposing up from the earth, branches hovering above the house in a tangle of branches that, when observed, reveal the presence of a pulley system and hook, suspending two excessively heavy-looking flats of sawn wood. At its trunk has been constructed a skeleton structure of thick branches, stacked beside which are whole logs cut through and stacked where they’ve been parted. Two fires at opposite ends of a small square area defined by the gushing pillars of ashy-gray smoke that fills the space with a thin veneer of monoxide, aided by yet a third cauldron of a stove afronting an area lined with picnic tables. Altogether, the scene conjures a forest encampment, situated among rows of houses and busy streets, people stopping to watch over the fence lining the front yard. Cars pass with thumping bass, songbirds in sonic murmuration as the light lowers pink and orange over the treetops. Saner begins the work by scaling, effortlessly, the heights that become larger and larger, knowingly navigating every section of the tree’s labyrinth of branches, until you realize, these heights are potentially fatal and he’s up there without a harness. Perched at its top boughs, where he has built a worktable for his tools, he begins the performance by cutting loose one of the massive wood flats which drops the deadly distance thudding against the dirt with the force of a bomb, literally rattling the neighbor’s windows, setting their dogs into a howling, barking panic. It settles the crowd, too, who are hooked. How can you not be? Davis moves the first flat by climbing beneath it and slowly wriggling it along to the sidewalk. He ascends as well, each movement a potential slip or missed grip, moving among the vista of branches. Two gray-haired women fan their noses with the numbered, editioned showcard, watching intently as Saner and Davis make their way down and move into exploration of all manner of weight-counterweight balancing techniques, at first with Saner atop Davis’ shoulders, then holding onto each end a long, gnarled branch, leaning back and circling their new, shared center of gravity — until they move down off the skeleton branch-structure and Davis moves into a series of leaps in place, without taking any additional steps from one stack of cut tree piles to the next highest one, and up eventually atop the structure again. Davis continues this way until, as Saner has slowly moved a thick section of log from the underside of the structure, the two move back into projecting danger by lobbing the log, gently at first, then higher and higher as they move further and further apart, heavy enough their joints were audibly popping as Saner strained to catch and contain its weight. Up and down the tree, and at one point (I managed to lose track of the order), Davis is hoisted aloft on a hook from the ground all the way up to the topmost branches, dangling, again, life-threateningly high. It’s an image in celebration of and emblematic of the simple joy of climbing trees, shared between the men of two distinctly different ages, with literally no difference in the fluency of the movement, or surety of pace. 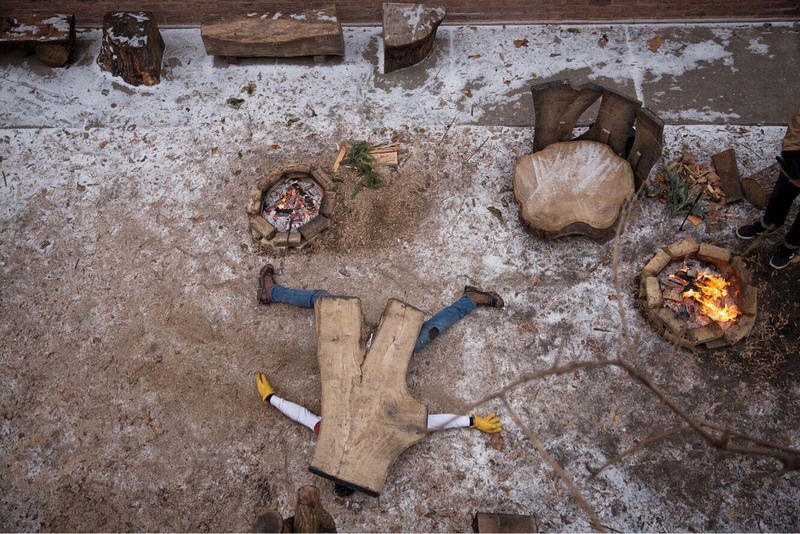 Perhaps no more so in the performance than when, on the ground again, having cantilevered the wood onto Saner’s back after sitting under it, he begins to crawl away and Davis jumps atop the newly exposed surface. They switch again and, flipped by Davis, Saner is left with his knees hooked over its edge, is raised and held upside down on it by Davis, who stabilizes the wood and slowly, holding it in place, rotates the board, simultaneously mirroring the solar transit and Saner’s own life-transit, his long, white hair dragging in the dirt.